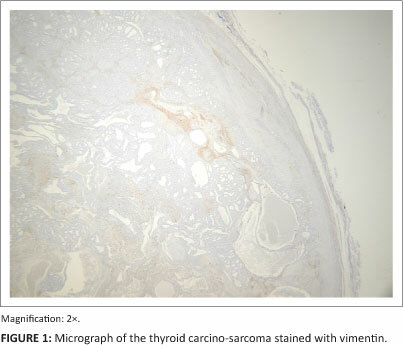 An adult male greyhound was diagnosed with a thyroid carcino-sarcoma by means of histopathology and positive immuno-histochemistry staining for cytokeratin and vimentin. Surgery and radiotherapy of the area were successful in local tumour control. Adjuvant chemotherapy was recommended to treat and prevent further metastasis. The use of carboplatin, metronomic cyclophosphamide chemotherapy and toceranib failed to control the progression of distant metastasis. The survival time was seven months from the time of diagnosis. This is the eighth case of carcino-sarcoma of the thyroid documented in veterinary medicine and the first one treated with a multimodal approach based on surgery, radiotherapy and chemotherapy. As documented in human medicine, chemotherapy appeared to be ineffective to prevent or delay the progression of the metastatic disease in this case. Canine thyroid tumours can be classified either as benign adenomas or as malignant carcinomas, with the latter type more frequent (80% - 90%) (Grubor & Haynes 2005). Thyroid carcinomas tend not only to be extensively locally invasive, but also to spread both to the regional lymph nodes and to the lungs at a moderately high metastatic rate (40% - 80%). The median survival time after surgery is three years if the tumour is considered to be removable and only 6-12 months if the tumour is firmly attached to the underlying tissues, indicating that it is more locally invasive (Klein et al. 1995). Malignant tumours of the thyroid gland are histologically classified as follicular carcinomas, papillary carcinomas, solid carcinomas, undifferentiated carcinomas or carcino-sarcomas. Carcino-sarcomas are rare malignant tumours that originate from both the epithelial and the stromal components of the thyroid tissue. Histopathology usually shows a characteristic biphasic pattern of follicular carcinoma and mesenchymal differentiation with a chondrosarcomatous component and osseous metaplasia (Cooper & Baker 1989). In dogs, carcino-sarcomas have been described to arise from the thyroid gland (Grubor & Haynes 2005), the mammary glands (Misdorp et al. 1973), the lungs (Salas et al. 2002), the salivary glands (Perez-Martinez et al. 2000), ceruminous glands (Moisan & Watson 1996) and the eyelids (Hirai et al. 1997). 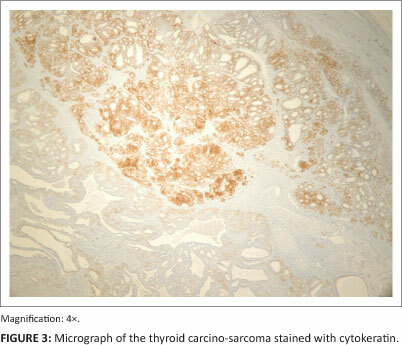 Thyroid carcinosarcomas in humans are very rare tumours, representing only 0.1% of all thyroid malignancies. They are recognised to behave aggressively and associated with a poor prognosis (Naqiyah et al. 2010) and an average survival time of only 5-6 months (Al-Sobhi et al. 1997). From sporadic reports of carcino-sarcomas in dogs, these tumours seem to behave in the same manner as in humans (Grubor & Haynes 2005). The overall survival time is short and diagnosis is associated with a guarded to poor prognosis in dogs (Buergelt 1968; Grubor & Haynes 2005). An eight-year-old male neutered greyhound was presented to a veterinary surgeon for his yearly health examination. On physical examination, a movable subcutaneous left cervical mass (3 cm - 4 cm) was noted as an incidental finding and a fine-needle aspirate was performed. The cytological evaluation of the fine-needle aspirate was non-diagnostic and a decision was made to excise the mass surgically. 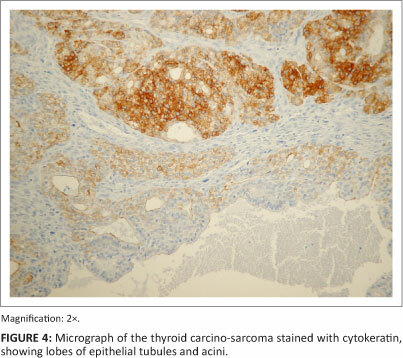 Histopathology revealed the mass to be a malignant thyroid tumour with two distinct cell populations. The first group consisted of dense lobes of tubular and follicular structures lined by cuboidal to oval cells, with moderate anisokaryosis, an increased nucleus-to-cytoplasm ratio and moderate numbers of mitotic figures. The second population of cells consisted of a dense proliferation of sheets of streaming stellate to spindle cells, with vesicular nuclei and prominent nucleoli, marked anisokaryosis, frequent mitosis and multifocal areas of osteoid matrix. The mass was diagnosed as a mixed thyroid tumour and was described by the pathologist as a follicular carcinoma associated with the development of an osteosarcoma within the thyroid gland. The margins did not appear to be well defined as neoplastic cells were present at the edge of the histopathology sections. In view of such a rare diagnosis, a slide review and additional immuno-histochernistry were requested. Results showed cytoplasmic staining that was strongly positive for cytokeratin and moderately to strongly positive for vimentin, specific markers for epithelial and mesenchymal cells, respectively. These results confirmed the diagnosis of carcino-sarcoma (Figures 1-5). The patient was referred to the clinic for further evaluation eight days after surgery, with a view to undertaking possible post-operative adjuvant treatment. Following admission to hospital, a computed tomography (CT) scan of the neck and thorax was performed for staging and treatment planning purposes. The study revealed a heterogeneous and diffuse, contrast-enhancing soft tissue opacity in the subcutis of the left ventral neck, compatible with scar healing tissue. The left thyroid gland was not present. The measurements of the regional lymph nodes were within normal limits. A 2-mm nodule of soft tissue opacity was observed at the ventral aspect of the left cranial lung lobe. The rest of the thoracic study revealed no marked abnormalities. Owing to the very small size of the unique pulmonary nodule, no sample could be taken for analysis and its differential diagnosis included both benign (inflammation or granuloma) or malignant (primary or secondary) processes. Following the CT scan it was decided to start a course of radiotherapy for the neck and to re-evaluate the pulmonary nodule a month later. The elected radiation protocol consisted of the use of three short accelerated courses at monthly intervals. The patient received four 4-gray fractions over two days (16 gray per course; 48 gray in total). The owner chose this protocol over a hypofractionated course or a definitive course in order to minimise the time spent in hospital by the patient and to avoid acute side effects. The protocol also allowed for re-evaluation of the pulmonary nodule during the treatment period. Computer-assisted radiation planning (Cad Plan, Varian) was performed by a certified radiation oncologist. The clinical target volume was defined as the visible gross tumour volume (based on the CT study), together with the ipsilateral retropharyngeal lymph node and an empirical margin of about 2 cm along the left lateral aspect of the trachea and the oesophagus. Another 5 mm of the margins was used in three dimensions to define the planned target volume (PTV). Two parallel-opposed wedged 6 MV beams were used (Clinac 600C, Varian). The PTV received a median dose of 4.01 gray per fraction. One month after the patient's first radiotherapy treatment, the CT scan was repeated. The scan showed no sign of local tumour recurrence in the cervical area, but the pulmonary nodule appeared larger (5 mm). 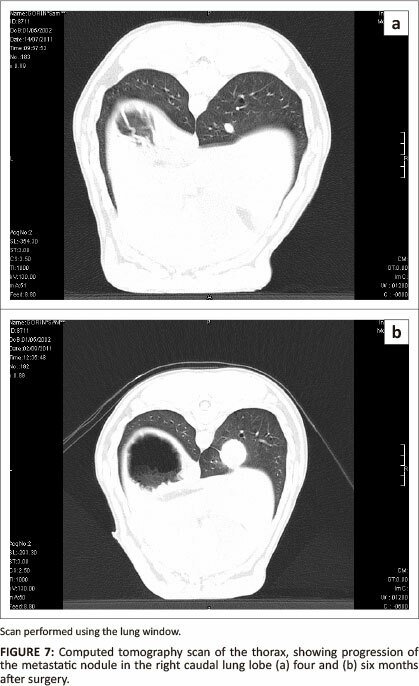 In view of this apparent change, concerns about possible metastatic disease were raised and the owner decided to discontinue the radiation treatment in favour of a palliative chemotherapy approach. Carboplatin at a dosage of 250 mg/m2 every three weeks was initially chosen to reduce the progression of the metastatic disease. The dose of carboplatin used in this case was lower than the normal scheduled dose of 300 mg/m2. The reduced dose was chosen as the patient' s white blood cell count during the complete haematology examination performed prior to the initial dose of chemotherapy was below normal (3.73 χ 109/L; reference range = 6-17 χ 109/L). The low total white blood cell count was attributed to breed, as greyhounds are commonly reported to have lower white blood cell reference ranges than other dog breeds (Steiss et al. 2000). 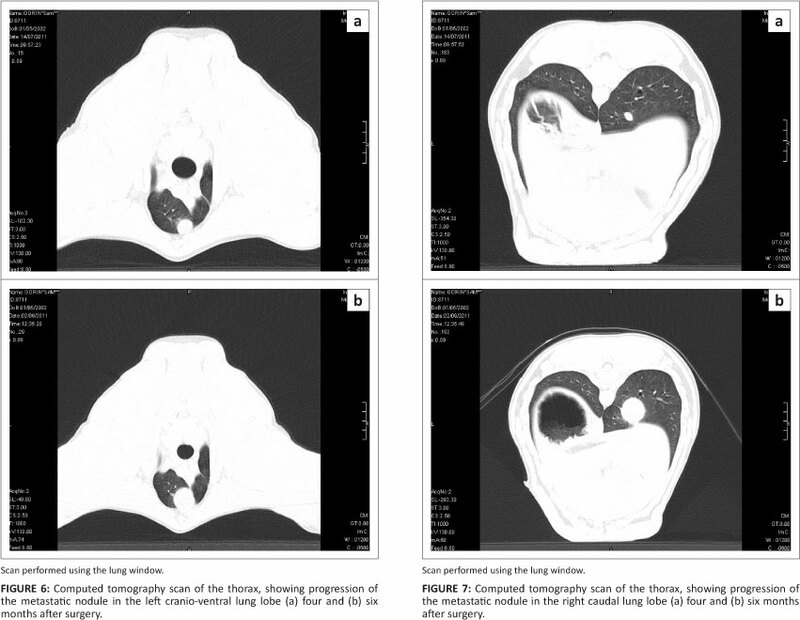 Following two cycles of carboplatin, the thoracic and neck CT was repeated and a further increase in the size of the pulmonary nodule was observed (6 mm). Moreover, another pulmonary nodule (5 mm) was detected at the dorsal aspect of the caudal lung lobe. There was again no evidence of local recurrence or regional lymph node involvement in the neck. Given the evidence of distant disease progression, it was decided to change the chemotherapy regimen from a maximum-tolerated-dose regimen to a metronomic chemotherapy protocol involving the administration of cyclophosphamide at 10 mg/m2 once daily. One month later, further progression was observed by means of CT. The initial nodule now measured 1.6 cm, the second 0.9 cm and a new nodule of 0.7 cm was detected in the caudal right lung lobe. In view of the therapeutic failure, cyclophosphamide was discontinued and toceranib, a broad-spectrum tyrosin kinase inhibitor, was initiated at a dose of 2.75 mg/kg every other day. Again this was lower than the scheduled dose for the reasons described previously. The toceranib was administered in conjunction with loperamide, sucralfate and omeprazole. The dog tolerated the toceranib extremely well, without any noted side effects. A set of thoracic radiographs was performed 20 days after starting the toceranib treatment. These radiographs revealed only mild tumour progression within the accepted limitation of comparing CT and radiograph studies, and it was decided to continue with toceranib treatment alongside meloxicam. Unfortunately, when the dog was presented for his next assessment one month later, the radiographs revealed significant progression of the lung lesions. It was consequently decided to stop the chemotherapy altogether and to continue with meloxicam only. The patient developed oedema of the fore limbs 20 days after chemotherapy was stopped. It was postulated that this was possibly due to reduced venous return secondary to the metastatic disease in the cranial thorax. Despite supportive treatment with corticosteroids and opioids, the dog failed to improve and was euthanased (Figures 6 and 7). 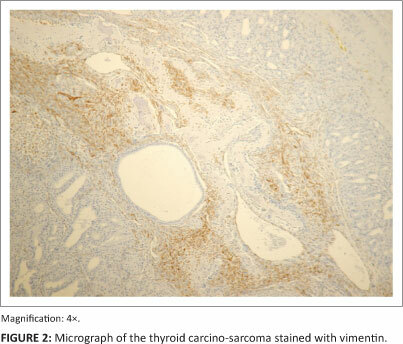 In humans, carcinosarcomas of the thyroid gland are a well-recognised tumour histotype and are associated with a poor prognosis, similar to that of anaplastic thyroid carcinomas (Al-Sobhi et al. 1997). External beam irradiation and chemotherapy have been recommended but these treatment modalities do not appear to impede further disease progression or improve the survival times of patients diagnosed with these tumours (Naqiyah et al. 2010). Unfortunately, owing to the rarity of this disease in humans, no standard adjuvant treatment has been proposed. Anaplastic thyroid carcinomas in humans occur more frequently than carcino-sarcomas and both have been shown to be biologically aggressive tumours with similarly poor outcomes. In the case of anaplastic thyroid carcinomas, neither biopsy alone nor chemoradiation nor cytoreductive surgery with chemoradiation nor complete excision with chemoradiation have shown significant difference in outcome and survival time (Chang et al. 2005). The canine thyroid carcino-sarcoma in this report showed similar biological behaviour and was also associated with a poor prognosis. Considering the rarity of this disease and the small number of published cases, it will be difficult to study the outcome of new treatment approaches for this tumour type. Interestingly, in this case the local control of the tumour was effective. It is likely that this can be attributed to surgery alone, especially as this was a small and movable tumour. It is also likely that the short course of radiotherapy did not contribute to the local control of the tumour, as only a moderate dose was given and the course was interrupted. Possible future treatments for preventing or slowing the progression of metastatic disease remain to be investigated. A prompt diagnosis and surgery combined with an aggressive chemotherapy protocol in the absence of visible metastasis may possibly be more effective, but further study is needed to investigate this hypothesis. A.G. (Veterinary Referral Cancer and Critical Care) was the main author of the manuscript. J.B. (Veterinary Referral Cancer and Critical Care) was responsible for the radiation therapy. J.G. (Veterinary Referral Cancer and Critical Care) was responsible for the medical oncology treatment.